These oversoles are really second soles for treacherous footing conditions. 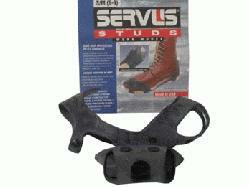 Made of extra strong stretch rubber, they fit snugly over shoes and boots. Handy heel tabs grip for easy on and off. Tough tungsten carbide studs bite in and are easily replaceable. These practical slip-resistant oversoles store easily in a pocket or work belt until they are needed. Made in the USA. Sizes S/M-XL.